My maternal grand parents lived in an agricultural village on the banks of river Cauvery, in South India. We visited them every year during our summer holidays. It was a tedious eight hour long journey from our place. Since we were averse to stopping at any food joint on the way, mother usually carried tamarind rice, curd rice and vadams (rice crispies ) to go with the meal. It was a family favorite food combo, and we liked to eat it under the shade of the trees which mounted the high way. Towards the end of the journey we took a diversion from the highway into a narrow mud path which lead us to the village. The wind created green ripples on the vast sea of paddy fields. The cool breeze from the river ruffled the tender green leaves of the tamarind and neem trees infringing on both sides of the path, and soothed our sweltering bodies. River baths, coracle rides, long walks on the bunds which bordered the paddy fields, relishing tender coconut water were all the jolly good activities we looked forward to during our stay in the village. The special attraction was the Sri Rama temple where we received the flavorsome puliogare as prasadam, ( Food distributed after offering to God). Of course nothing could be compared to the love and pampering showered on us by grand mother. She entertained us with hilarious and enthralling stories about all the members of our family. There were a few things in the village that we dared though. 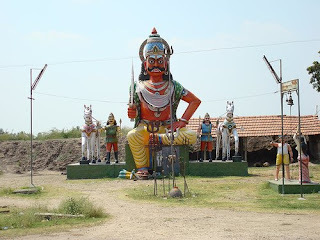 The huge Aiyanar (village deity ) idol painted in bright gaudy colours , towering over all the houses around was one dread. With a thick twirled mustache and a trident in hand, the fierce wide eyes stared at us to give us the creeps even in the broad day light. Then there was the big old tamarind tree which stood innocently at the far end of the garden. Stories about the ghosts which lived in tamarind trees were very frightening. In addition to this, the hoots of the barn owl and the rustling of the tamarind leaves sent shivers down our spines when we had to visit the rest room (which was situated at the bottom of the garden ) at night times. Though mother or grand mother chaperoned us to and fro, we could still hear our hearts thudding, when we hit the bed. The morning sun dispelled our fears along with the darkness of the night. The tamarind tree housed a family of parakeets in the hollow of its trunk. My kid brother had almost picked up a fledgling from the hollow, but grand father caught him in action. He extracted a promise from all of us that we would never ever disturb the home of any being. We were satisfied to watch the fledglings screech and baby talk, by standing up on the adjoining stone bench. Paramasivam collected the tamarind fruits, and sat on the stone bench. He lazily squashed the fruits one by one and removed the crust. Then he separated the fiber and the seeds. The pulp was stored in huge ceramic jars to be used the next year. Tamarind like wine tastes good by aging. It was customary to picnic on the sandy banks of the river on the Chitra Pournami night (The full moon night which falls between the 14th of April and the 14th of May every year. )The atmosphere was charged with fun and frolic that even our parents and grand parents shed their inhibitions and played blind man’s buff and running and catching. The high light of the picnic dinner was of course Puliogare. 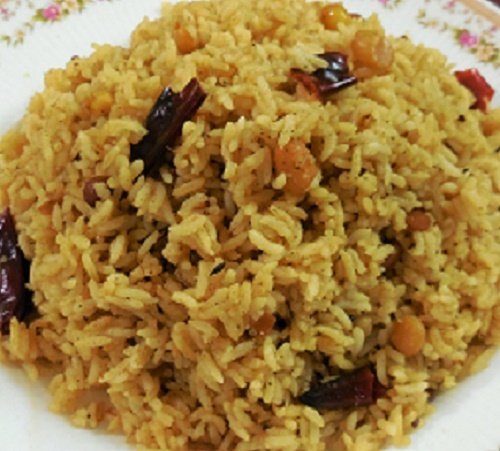 There are many methods to prepare the Puli Kachal which literally means boiled tamarind, used in preparing puliogare. 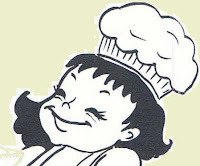 Grand mother was very particular to follow the original formula without deviating from the original recipe. 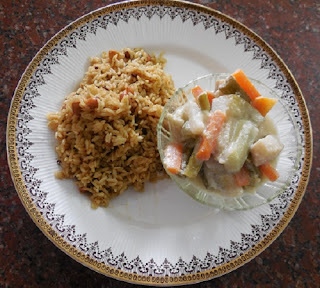 Mother was adventurous and here is her recipe where she has combined the simple version and a complicated version ! To make Puliogare you first need to make Puli Kachal or the Tamarind Paste. If properly prepared, this can be stored for a very long time just like any pickle. It can be mixed with rice anytime you want Puliogare. Stored in a fridge, Puli Kachal can last over 8 months! 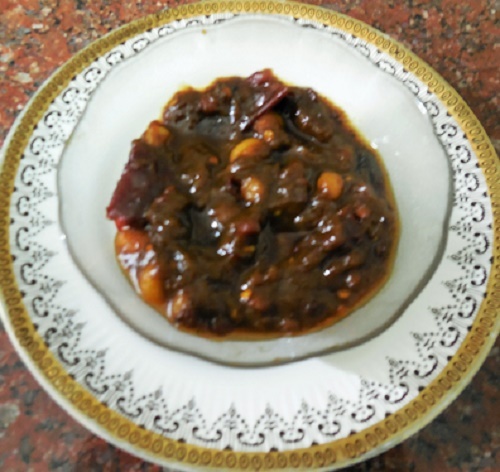 To make Puli Kachal (spicy tamarind paste ) for Puliogare. Dry coconut gratings (Copra) -1 tbsp. Tamarind - enough to make a lemon sized ball. Sesame oil - 2 ladles. Set 3 Seasoning:Mustard seeds – 1 tsp. Black gram dal (urad dal) - 1 tsp. Bengal gram dal (channa dal)-1 tsp. Ground nuts - 50 gms. Red chillies - 10 -12. Prepare the masala powder using Set 1 ingredients. 1. In a pan, dry roast sesame seeds until they crackle and keep aside. 2. Next, dry roast fenugreek seeds until deep brown and pleasant smelling, and keep aside. 3. Next, dry roast black pepper until it crackles, and then add cumin seeds and roast together. 5. Once all the the roasted ingredients are cooled, use a dry grinder and grind them together into a fine powder. 6. In the last round of grinding, add the dry coconut gratings as well. The aromatic masala is now ready. 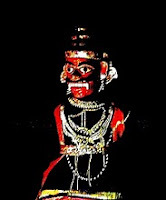 We will now use Set2 and Set 3 ingredients to make the Puli Kaachal base. 2. Heat the sesame oil in a thick bottomed pan. 3. When the oil is hot enough add the mustard seeds. 4. When mustard splutters, add the black gram (urad) and bengal gram (chana) dals and fry until they are golden in colour. Don't let it become dark, as it gives a bitter taste. 5. Next add the ground nuts and fry until they crack. 6. Add the broken red chillies and the curry leaves. 7. When the chillies become crisp add the turmeric powder and stir. 8. Now add the tamarind juice, salt and jaggery, and cook gently stirring now and then. 15. Keep cooking until the mixture thickens. This can take a long time, approx 20 mins depending on the consistency of your tamarind juice. You know it is ready when the mixture is really thick, and the oil separates out into a layer. 16. Now add the previously powdered spice or masala and stir well. 17. Your delicious Puli Kachal is now ready. Cool it thoroughly, and store in a clean dry bottle. 1. Cook rice and spread in a wide plate or tray to allow the rice to cool. Break up lumps and separate the rice and see that none are sticking together. 2. Add puli kachal, a little at a time and mix gently with a spatula, coating the rice until it acquires a reddish brown colour. Do this carefully, as you don't want to mash the rice too much into a paste! 3. You can use the quantity of paste as per your taste buds! I use 2 tbs of the puli kachal above with 2 cups of cooked rice. This makes enough to serve 3 - 4 people. Serve with rice crispies or chips. Plain curd or avial (a vegetable preparation in curd ) will go well with puliogare. Enjoy it without a side dish to savor its intrinsic taste. When served with curd rice they compliment each other's rich taste.